The Imperial Citadel of Thang Long in the capital Hanoi has become UNESCO heritage as the world culture body added this site to its top heritage list in the morning of Sunday (8/1/2010 - Vietnam time). The World Heritage Committee of the United Nations Educational, Scientific and Cultural Organization chose the new sites at a meeting in Brazil, updating its list of top spots for historical interest or natural beauty. The UNESCO World Heritage stamp is a valuable asset for countries as it boosts tourism. 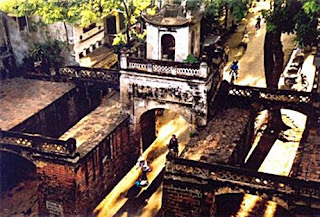 The Thang Long Imperial Citadel was first discovered in late 2002 during excavation work to build a new national assembly on Hoang Dieu Street, Hanoi. Thang Long Citadel was part of a citadel system built in the 11th century that included the Dai La Citadel, which acted as a defensive rampart with a complete dyke system, and the Forbidden City, where the king and his royal family lived. Vietnam is this year celebrating 1,000 year-old culture of Thang Long-Hanoi. Vietnam has nine things in the UNESCO heritage list. The cultural and natural tangible heritage sites are Hue Ancient Capital City (1993), Ha Long Bay (recognized twice in 1994 and 2000 as natural and geological heritages), Hoi An Ancient Town (1999), My Son Holy Land (1999), and Phong Nha-Ke Bang National Park (2003). Intangible heritage includes Hue royal court music (2003), Central Highlands gong cultural space (2005), Bac Ninh love duet and Ca Tru (2009).